The elder Ameijenda opened his own shop in 1957, and shared it for several years with Jose Lopez Cubillo. Cubillo had been the lead craftsman at the workshop of Jose Ramirez II in Madrid, Spain. Consequently, in a short period of time, Ariel’s father had the opportunity to learn techniques from the two leading schools of guitar building in Spain, located in the cities of Madrid and Barcelona. Ariel’s father also acquired a great amount of knowledge repairing the guitars made by the world’s finest makers. Andres Segovia lived in Montevideo for nine years, and where the maestro went, fine guitars followed. Thus, Montevideo was the home of far more than its fair share of excellent instruments. Guitars by Hauser, Simplicio, Santos Hernandez, and many others flowed through the Ameijenda workshop for adjustments and maintenance, giving him a close up look at the work of these masters. As a child helping in his father’s workshop, Ariel learned the finest techniques used by world class makers of classical guitars and renaissance and baroque string instruments. More importantly, the passion necessary for such pursuits came to him quite naturally and very early in life. At the age of 14, under his father’s guidance, Ariel progressed from helping with repairs to the construction of his first instruments. When he was 19, Ariel entered the University where he studied Musicology. During those four years, he paid special attention to the subjects of Acoustics and Music History. These were very useful studies which have greatly influenced his approach to the construction of guitars and ancient instruments. In 1997 Ariel opened his own workshop in Montevideo. He now sells guitars and period string instruments to musicians all over the world. Recently, his reputation has widened considerably after presenting his instruments at two events in the United States. In 2007 at the Alexandria Guitar Festival in Alexandria, Virginia and in 2008 at the New York Guitar Seminar in Manhattan. At present, Ariel also works as a teacher at the Escuela Universitaria de Música (University School of Music) teaching ¨Guitar: History of its construction from the Renaissance to the Twenty-first Century¨. In 2011 he taught this same course at the Universidad Federal de Paraná (Federal University or Parana) in Argentina, and at the EMBAP Guitar Academic Symposium in Curitiba, Brazil. 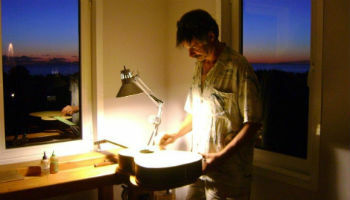 In order to respond to the growing list of orders placed to purchase his guitars, in 2014 Ariel moved to the heavenly settings of the Cerro de los Burros near the city or Piriapolis in the East Coast of Uruguay, to be able to fully commit to the manufacturing of the finest guitars in his workshop personally designed by him.